2018 is shaping up to be an exciting year for Winchester Cathedral, as our five-year, £20.5m, conservation and exhibition programme draws to a close and there are two associated major events planned. At the beginning of the year, work commenced on ‘The Great Reveal’, when scaffolding began to be dismantled in the quire, which will expose the newly-restored high vault, bosses and medieval windows. This also gave the chance to give the Great Altar Screen its 100-year spring clean. This project is due to be completed in May. So there is much to celebrate at the Cathedral and to herald this, there will be two showcase events. The Stone Festival returns to Winchester Cathedral’s historic Inner Close this summer (15 – 17 June), with an exciting programme of events and activities celebrating the art of stonemasonry. Masons will gather within the Inner Close of the Cathedral and carve sculptures of their own design, based around the theme “Kings and Scribes”. All carvings will be auctioned on the Sunday afternoon, with the proceeds going towards supporting the ongoing restoration works at the Cathedral. Visitors to this free event will have the opportunity to meet the masons and discuss their individual works, have a go at carving, learn more about this ancient art and see what impact this vital work has on the life of the Cathedral today. Last year’s event caused quite a buzz around the place as visitors saw first-hand conservation in action, stonemasonry often being a hidden craft. Another returning event is the eagerly anticipated Winchester Cathedral Flower Festival returns form 5 – 9 September with a stunning array of flower arrangements inspired by the magnificent Winchester Bible, the largest and finest surviving 12th-century English bible. Visitors will be invited to immerse themselves in a riot of colour as the Cathedral is transformed by striking and fragrant floral displays evoking the Bible’s exquisite illuminated initials and elaborate decorative schemes coloured with gold and lapis lazuli. Also returning is Creative Director Angela Turner, having previously led the team for the Cathedral’s Flower Festival in 2013. Angela is a regular exhibitor at RHS Chelsea Flower Show and has won many of their highly coveted RHS gold medals. Angela’s flair and understanding of the Cathedral will result in a spectacular event. Tickets are £12 with a variety of concessions (including groups of 15+). Of course the year will be rounded off by the increasingly famous Christmas Market and outdoor Ice Rink from 17 November – 20 December (6 January for the rink) offering over 100 chalets with their cornucopia of Christmas goodie and a smorgasbord of tasty treats. 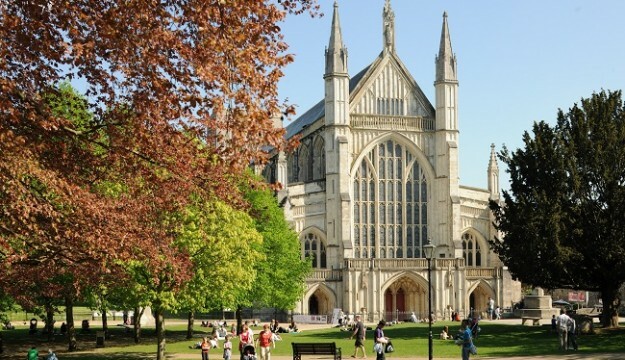 All in all a very year for Winchester Cathedral and one with something for all tastes.